Author: John Vanderelst. Series edited by: Wilhelm J.G. Möhlig, Bernd Heine. 20 pp. Roman, 263 pp. 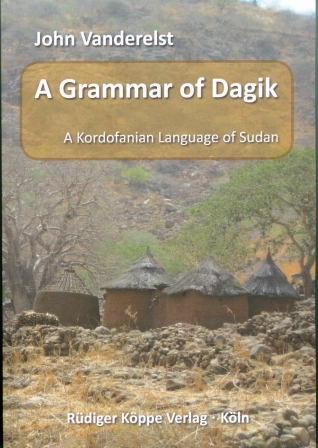 The Dagik language is spoken in the Nuba Mountains in the Republic of the Sudan. It belongs to the Talodi subgroup of (what is known as) the Kordofanian language family. Dagik speakers call themselves Duwa and their language Dhaduwa. To outsiders, they are also variously known as Nuba Dagik or Masakin. It is a small ethnic group consisting of 15,000 to 20,000 speakers. The Dagik home area consists of scattered villages in the Buram district, southeast of Kadugli, in the South Kordofan province. Large Dagik communities also live in Omdurman, Gedaref, and in South Sudan. Prominent previous references to the Dagik in the literature, both linguistic and ethnographic, include Nadel (1947), Stevenson (1956-57), Riefenstahl (1974), and Schadeberg (1981). However, little was known about the language preceding this monograph. This monograph is the first published complete grammar on a Talodi language. It is based on first-hand data collected by the author. The data corpus includes a word database, a sentence collection and a text collection. It is couched in a descriptive framework. It gives an overview of the language's structure from phonology (chapter 2) all the way through to clause structure. The nominal morphology is characterized by a rich nominal class and agreement system (chapter 3), the verbal morphology by many derivational suffixes (chapter 4). Further prominent word classes such as adjectives, pronouns and indexes are described (chapter 5 and 6). Chapter 7 presents an in-depth analysis of the expression of space. The study of motion shows that one needs to distinguish between motion sensitive to the position of the deictic center, and motion sensitive to the position of the Ground. Chapter 8 considers clause structure, both simple and complex, and closes with a look at information structure. A proposal for an orthography, an interlinearized text and a wordlist complete this description.